Cambridge United boss Jez George is unlikely to clarify his position until later this week after appearing to call his own future into question. George, 42, was downcast after Saturday's 4-1 home defeat by Wrexham but took training as usual on Monday. Speaking after the game, he said he took responsibility for the result. "That performance wasn't good enough so that means, if you're judging it this afternoon, I'm not good enough," he told BBC Radio Cambridgeshire. 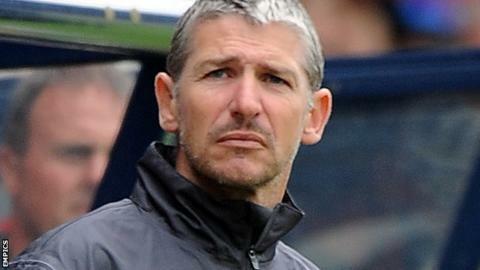 George has been in charge of the first team at the Abbey Stadium since February 2011, initially in a caretaker capacity following the sacking of Martin Ling and then on a permanent basis. However, he has worked for the club for six years in total, having previously run the club's academy and filled the role of director of football, and he also remains a member of the board. Cambridge finished ninth in the Blue Square Bet Premier last season and, after strengthening the squad over the summer, George was hopeful they could mount a promotion challenge this term. But they have not won any of their last five games and the defeat by Wrexham, which left them 17th in the table, was followed by booing among the crowd. "It's not nice but it's understandable and totally justified," added George. "It's the first time it's happened since I've been here. "When we compete, stay in the game and work hard, they're with us, but we were so poor you wouldn't expect anything different, so I don't blame them. "We want to be a source of pride for our fans, we don't want to be an embarrassment. "The players did everything they could, but I take responsibility. "I signed them, I pick the team, I decide how we try to play and it's easy to beat me with every stick at the minute, but I understand the situation. "All I want is for this club to be successful, so that's for me to think about."